The perfect trail basket for all Jeepers. 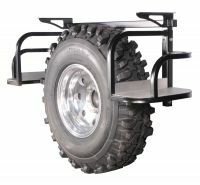 Installs easily into our square frame tire carrier in minutes. The perfect rack for camping gear or your latest kill! Our most popular Cargo Package! Combining the best of both worlds; the PUREJEEP stubby rear spindle bumper (w/ fog light mounts) and square frame tire carrier! 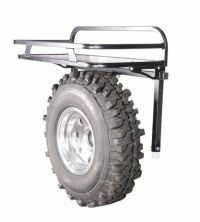 Featuring our all new 3/16" formed and fully welded stubby bumper, we incorporated our tailgate-supported square frame tire carrier for the ultimate in add-on options. Swing Away now opens in conjunction with the tailgate as a single operations with one lower latch for easy opening/closing! 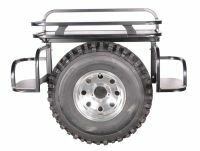 Combining the best of both worlds; the PUREJEEP stubby rear spindle bumper (smooth face) and square frame tire carrier! Featuring our all new 3/16" formed and fully welded stubby bumper, we incorporated our tailgate-supported square frame tire carrier for the ultimate in add-on options. The New "Smooth Top" PUREJEEP rear stubby bumper features mounts for the stock JK fog lights. Formed from 3/16" plate steel, precision formed, and fully welded, this stubby bumper will not sacrifice any ground clearance from the factory rear bumper.